Building Websites for Teacher Research In our presentation we focus on 5 core questions: l l l How are we creating Teacher. Research. net? What are the pedagogical challenges? What are the technological challenges? How are we assisting teachers to build websites? 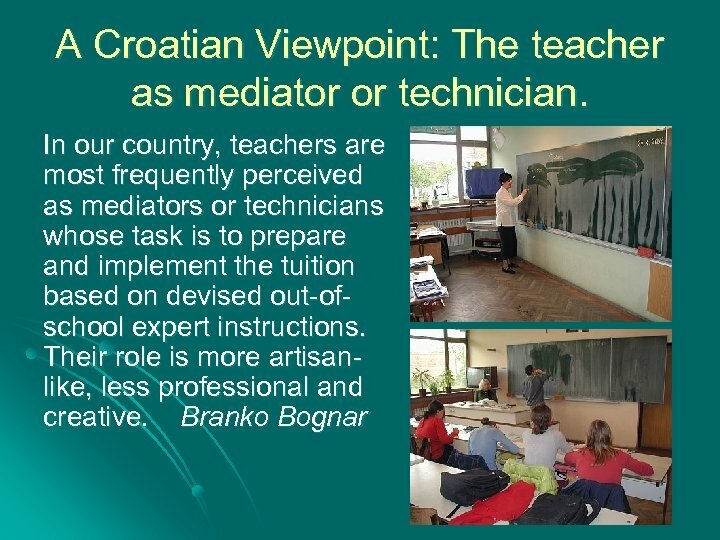 What are we learning as we assist the teachers? In our post-presentation discussion we focus on: l l How can we support access to teachers’ websites? How might we create an interactive TR database? A need for websites: l l Teacher Research has an increasingly high profile nationally and internationally, but it remains largely invisible and the knowledge created by teachers is often unseen, unshared and uncelebrated … websites are one solution. 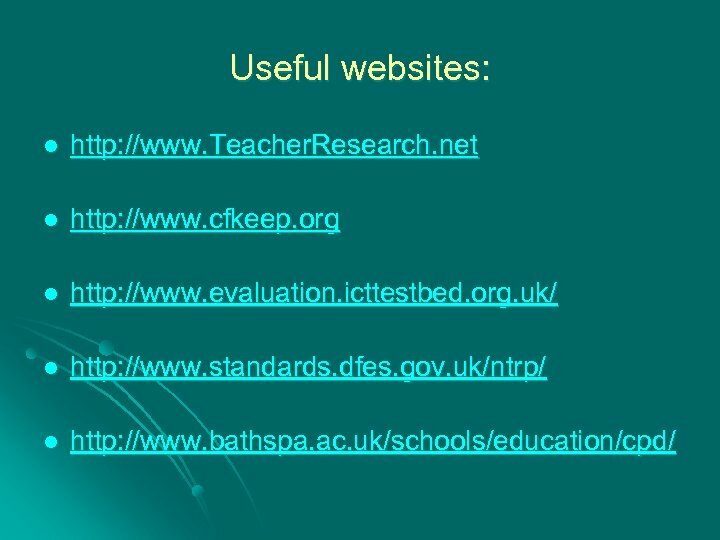 There are many websites relating to teacher research but, as yet, we have not solved the problem of how to harvest and disseminate more than a small fraction of this research. Neither is this problem unique to the UK. Pedagogical Challenges: l Providing a useful, accessible resource to assist teachers researchers to collaborate in research projects. l Creating an extensible teacher knowledge repository on-line. l Enabling access to teachers’ accounts in an attractive stimulating way and reviews of other useful resources. l Offering support to teachers who work alone as well as collaboratively with colleagues in LEAs and HEIs. 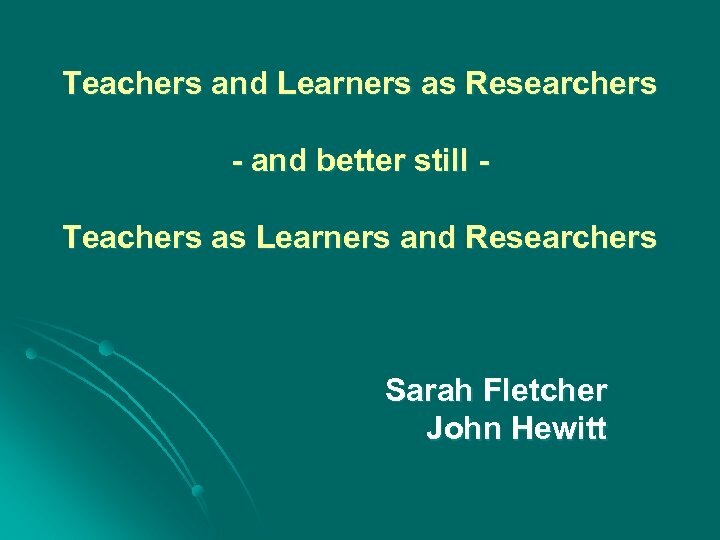 l Promoting and retaining the practitioner element of Teacher Research where research is done by/with teachers in their schools. Technological Challenges: • Creating and sustaining a core identity across its files. • Ensuring it interacts effectively with search engines. • Making it visually attractive and maximising ‘click through’, while encouraging visitors to check back in. • Ensuring the website is easy to maintain regularly. • Uploading large numbers of files with different formats. • Enabling an key word search facility across the site. 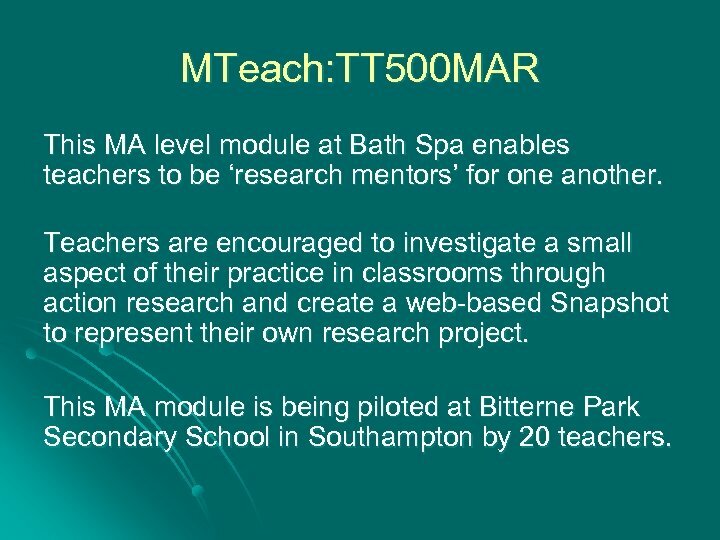 MTeach: TT 500 MAR This MA level module at Bath Spa enables teachers to be ‘research mentors’ for one another. Teachers are encouraged to investigate a small aspect of their practice in classrooms through action research and create a web-based Snapshot to represent their own research project. This MA module is being piloted at Bitterne Park Secondary School in Southampton by 20 teachers. What are we learning as we assist teachers in TT 500 MAR? l Though some teachers may be initially reticent, with appropriate support most are eager to represent and share their research projects through their websites. l They enjoy freedom to create a web-based Snapshot since they have creative ownership of the process. l The Carnegie Foundation KEEP toolkit provides a flexible, accessible, content-free scaffold for teachers. l It is essential for research mentors to assist teacher researchers by modelling how to create a Snapshot. l Teachers’ Snapshots could be linked to school websites. Creating Web-based Snapshots What are we learning in assisting teachers to create KEEP Snapshots? • • • Teachers need a simple accessible format which allows them to share and discuss their ideas with one another. Teachers enjoy creating Snapshots to communicate learning and can assist students to create them too. Teachers do not yet have access to a Template that will assist them in creating an MA level portfolio submission. 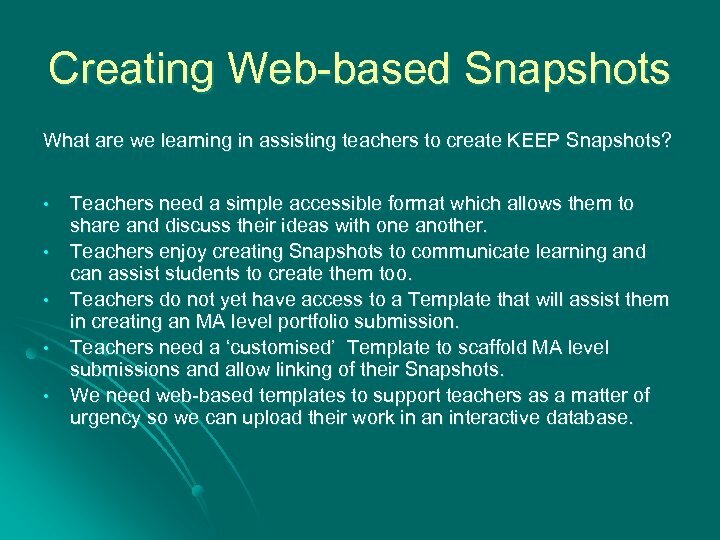 Teachers need a ‘customised’ Template to scaffold MA level submissions and allow linking of their Snapshots. We need web-based templates to support teachers as a matter of urgency so we can upload their work in an interactive database. Why do we need a database for teacher research? To create an extensible collection of teacher research documents that will l encourage teachers to make their ideas and work more accessible, l enable users to find relevant materials more easily and l allow consideration of user-based evaluation. Post-presentation Discussion l How can we improve access to teachers’ research through their own websites locally, nationally and internationally? l How might we create an easily extensible interactive Teacher Research database?